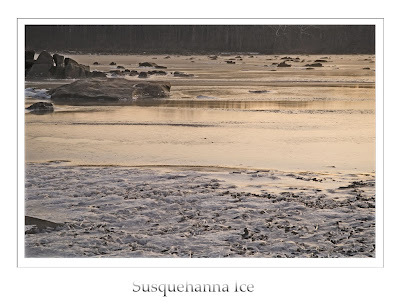 This morning it was 6 degrees and Steve, Jim, Annette, Arthur, Steve D., Lewis, Chuck, Irv, Gary, Keith, Chris, Don and Jessyca all headed north to the shores of the Susquehanna in hopes that the water flow from the Conowingo Dam had been shut down over night. When the timing of the water flow and the overnight temps drop this low, beautiful icy veils of frozen water form on the shore. We arrived just before sunrise at 6:45 in time to hike to the shore and get our gear set. We could tell upon sight of the river that the water was low, but flowing in the middle, perfect for the icy subjects we had hoped to find. We spent an hour photographing before we heard the flow of the water begin to crash the ice and begin to move it down stream. 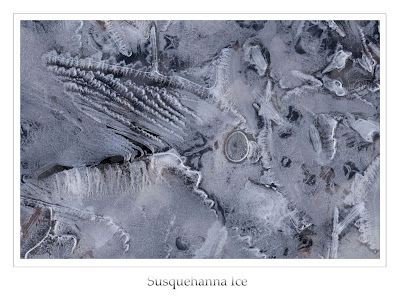 We watched our icy beauty disappear in front of us as we scrambled to higher ground and headed to the Mill Race, to shoot the frozen subjects there. After the sun began to hit the race we headed north to Deer Creek where there was amazing hoar frosted leaves along the stream. It was a beautiful frozen morning! These ice shots are flippin awesome!!! Great stuff, Karen! Barb told me you guys were heading up there. Unfortunately work got in the way. 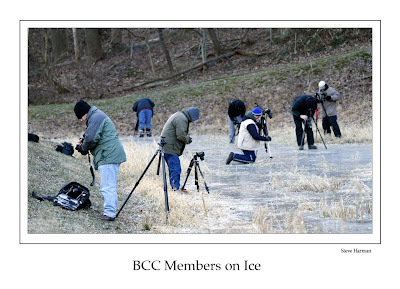 Please keep me in the loop for the next ice shoot! 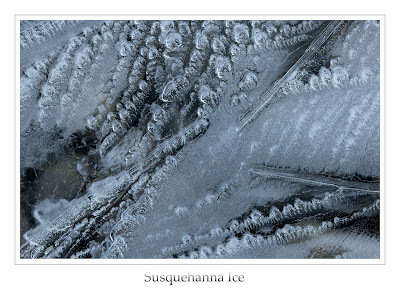 You bet, Steve and I are heading out to Cunningham Falls Monday, but will let you know on the Susquehanna. Really neat. 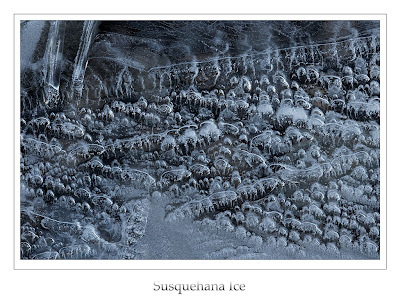 I had never looked at the ice this way. Thanks for giving me something new to love about the Susquehanna.